Battambang is a small city in the north-west of Cambodia, not far from Siam Reap, where the famous ruins of Angkor Wat are. 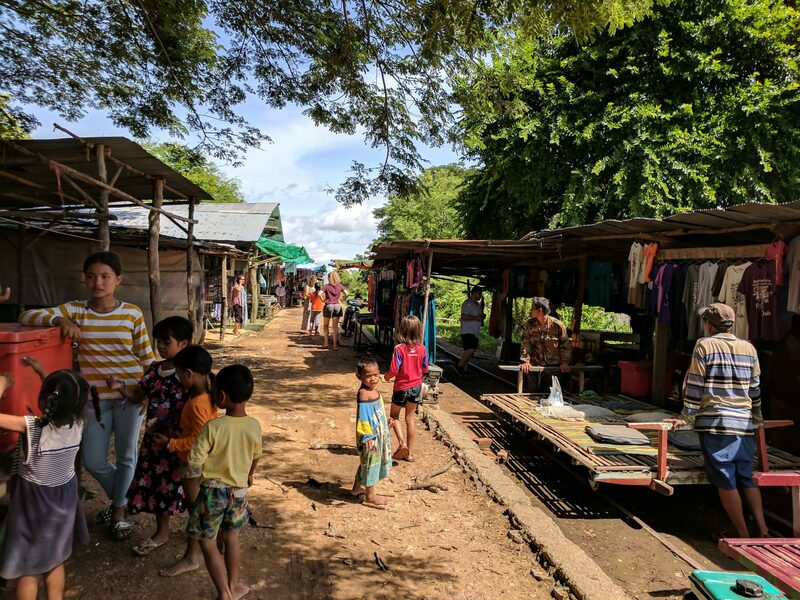 While it is not the most popular destination in the country, many people decide to stop there on their way to Siam Reap from Phnom Peng, the capital. 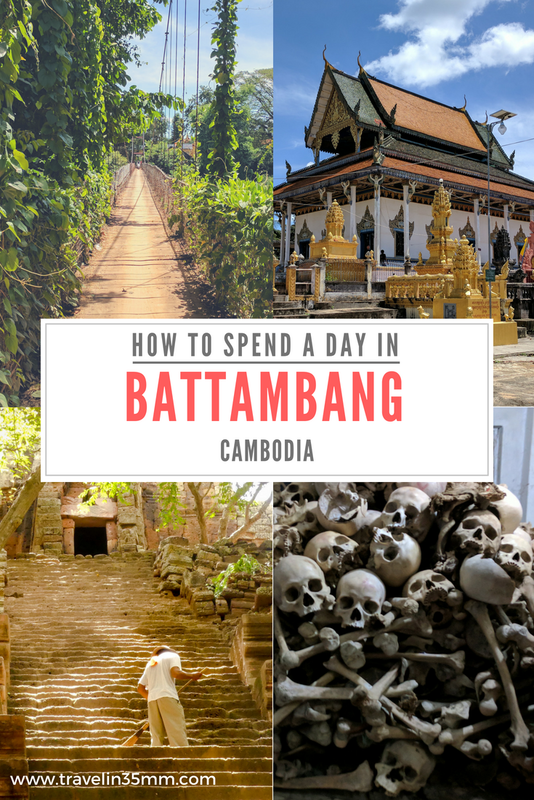 Since it’s not the kind of town where you would spend a lot of time, I decided to do a guide on how to spend a day in Battambang! Start the day in Battambang with the best ride possible: the Bamboo Train! This is probably the most famous attraction in town. Don’t let the name fool you, it’s not a train! It’s a bamboo platform with wheels and a tiny diesel engine. The way it works is amazingly simple, just a belt from the engine to the wheels, and that’s it! After putting the platform on top of the wheels and a few cushions on top you are good to go! Train railroads and stations were abandoned a long time ago in the country, but locals found a cheap and fast way of using them to transport goods! And of course, recently they also discovered its potential as a touristic attraction. The trip is short, about one hour including return. The view is very nice, going through jungle and plains to get to the nearest stop. Since the same line is used for both directions, you might find someone going in the opposite direction. But don’t worry! It’s not a problem at all. The platforms are so simple it takes two minutes to disassemble everything, let the others pass and reassemble it again. After half an hour you would reach the final stop. There, a market selling all sort of goods, and, of course, souvenirs, awaits. You can buy a memento from the fun trip, talk to the locals or just have a walk and watch the other platforms passing by. Finally, after a few minutes, it’s time to go back. You will see the same beautiful view from a different perspective, and enjoy the last moments on the bamboo train! There are a lot of temples in Battambang, so any of them would be a good choice. 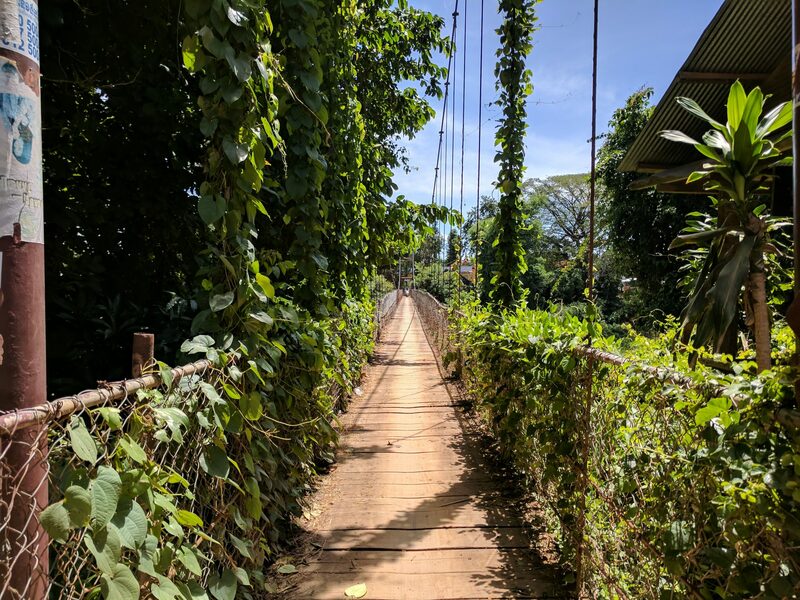 However, I’m going to choose the Kampong Pil Pagoda for a very good reason: there is a very cool swinging bridge you have to cross in order to get there! Not only is a beautiful bridge with a very nice view, it’s also very cool to see even motorbikes crossing it. After crossing the bridge you will find the temple very easily, as it has a shiny golden entrance decorated with statues of animals and lots of flags. Don’t worry about getting in, the gates are always open to visitors. Once you get inside the temple you can walk around as much as you want, always being respectful of course. If you have been in other temples in the country before you might not very surprised, but I think it’s always cool to have a look anyway. In order to get to the Wat Banan Temple, you will need a Tuk-Tuk, since it’s almost 20 km away from the city. It is, however, one of the best experiences you can have in Battambang. Travelling there means going through the rice paddies, and getting closer to the rural life of the country. The rice fields are always beautiful, with a saturated green colour that makes them look almost fake. You will see every once in a while someone working there, either alone or with the help of animals. If you are as lucky as I was, your Tuk-Tuk driver might even stop in one of them to explain the process of farming and growing the rice! It was very fun and educational experience. Once you arrive at the actual temple get ready, there is a really long way up there. It is located at the highest point, as it’s tradition, so in order to get there, you will have to climb through steep stairs. A lot of them. So many local kids will probably go around you with fans to make it easier, expecting, of course, a tip. As usual, in this cases, the best option is to refuse. Why? Children should be at the local school, not working! There is an increasing effort by the Cambodian government to tackle this issue, so you might even see signs explicitly asking you to do it. The temple is seldom visited by tourists, so you might be the only one there. 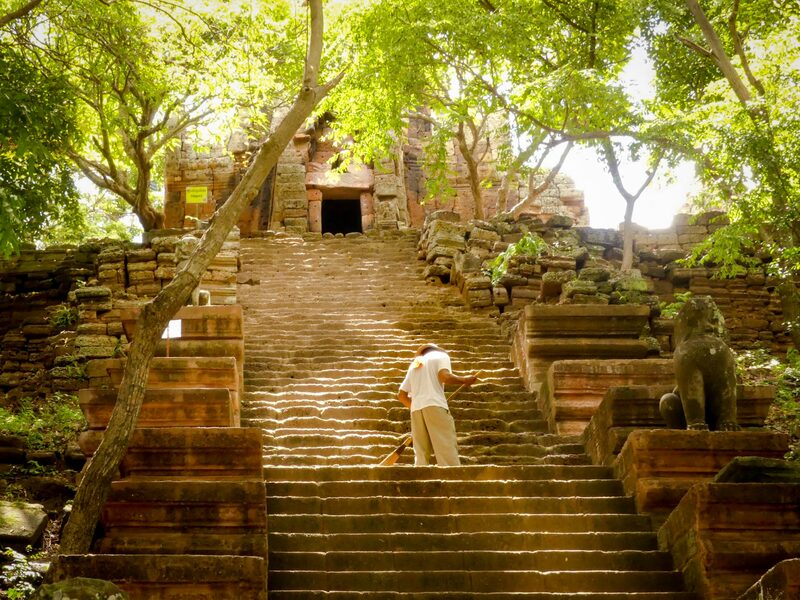 It is a fantastic way of exploring the ancient architecture of Cambodia without other people flocking everywhere. It is, however, visited by locals, that keep using it, but mainly on holidays. The temple itself is incredibly beautiful. 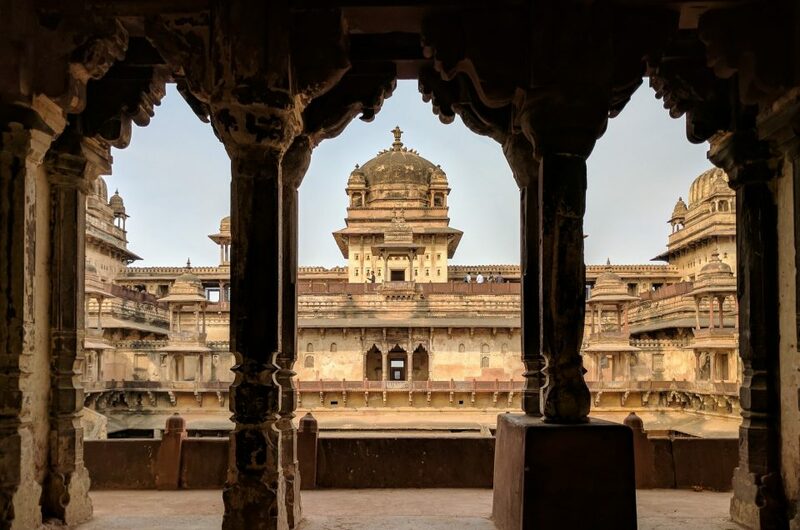 It was initially thought to be a prototype of Angkor Wat, but after some scientists dated it the hypothesis was discarded. Turns out Wat Banan was built later! Still, a very beautiful and relaxing place to visit. On top of that, the view from up there is also stunning! Turns out there is a reward for all those exhausting steps. The next stop in your day it’s a chance to look back at the tragic history of the country. Cambodia was famously taken over by the Khmer Rouge in the 1970s, not that long ago. Among all the atrocities the regime of Pol Pot and his clique, the killing of 25% of the Cambodian population in 4 years it’s the worst. Even today many people still don’t know where the remains of friends and family are. People were being systematically executed in areas known as killing fields, all over the country. 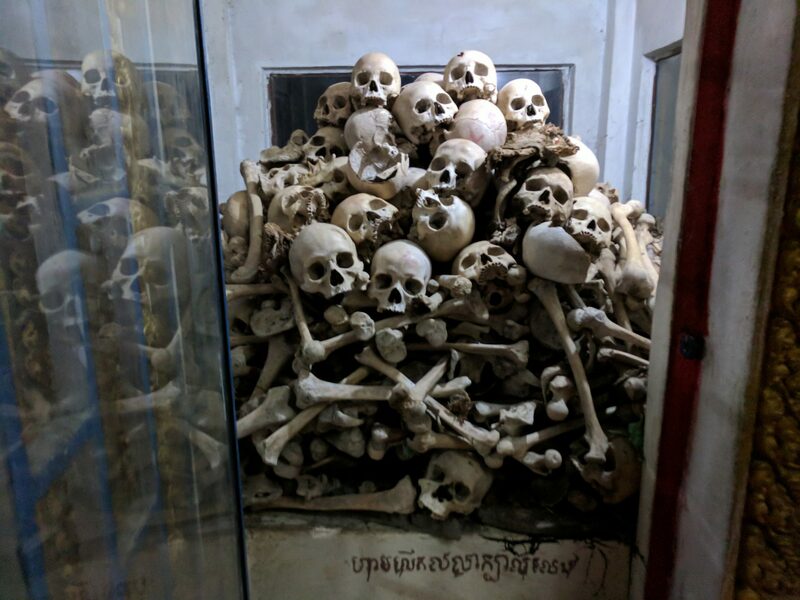 There are a few places where you can learn more about this tragic episode of Cambodia, especially the Choeng Ek Killing Fields, near Phnom Peng. Near Battambang, like near any major town, there is one of this horrible places: the Killing Caves of Phnom Sampeau. 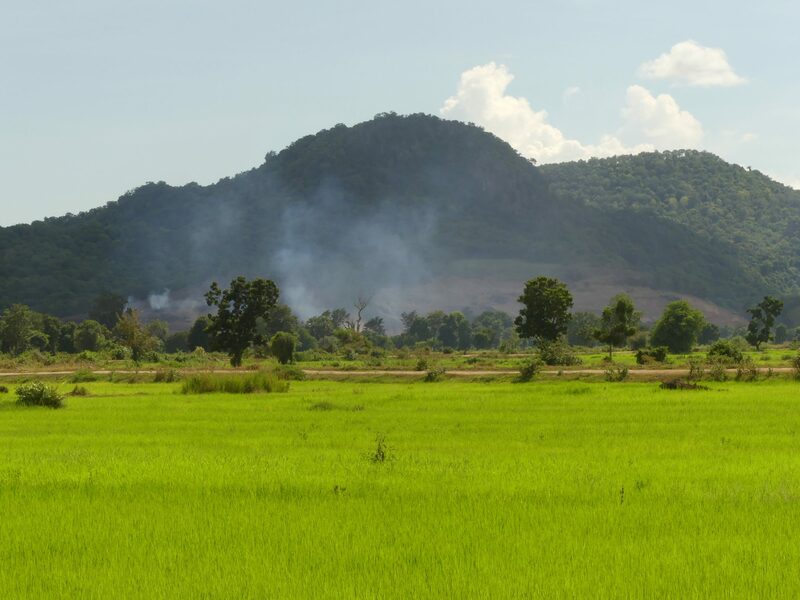 The caves are in a mountain, 11 km southwest of Battambang. So, again, you will need a Tuk-Tuk. In order to get there, you will need to follow a path uphill. After a few minutes, you will notice that the mountain has more than just the caves. Shrines and temples are all over the place, including the one that sits right next to the actual caves. This one has a collection of very unusual statues. 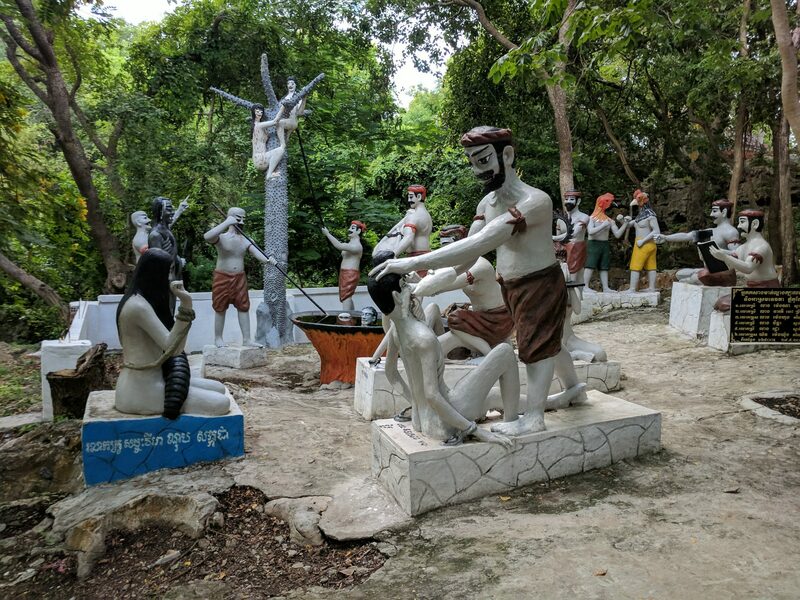 No Buddhas or religious imagery, these statues are made to explain the different torture and execution methods that were used against the victims of the Khmer Rouge. Keep walking a few more meters and you will get to the actual caves. In the caves, the Khmer Rouge killed the victims on top of the cave and threw them inside. Bullets were expensive, so knives, blunt weapons, sticks, farming tools… were used instead. Sometimes they were just pushed to their deaths from there. Different organizations try to find mass graves all over the country and those buried there. Often they are exposed to the visitors so they can contemplate the horror of the genocide. This is one of those cases. Down in the cave, alone, where everything is silent, knowing that deep inside that blackness there are still hundreds, if not thousands of bodies, looking at the skulls… it fills your heart with fear and horror. We might never know what the Cambodian people had to experience, but being there gives you a glimpse of it. A proof of what humanity can do at its worst, and a warning for future generations. 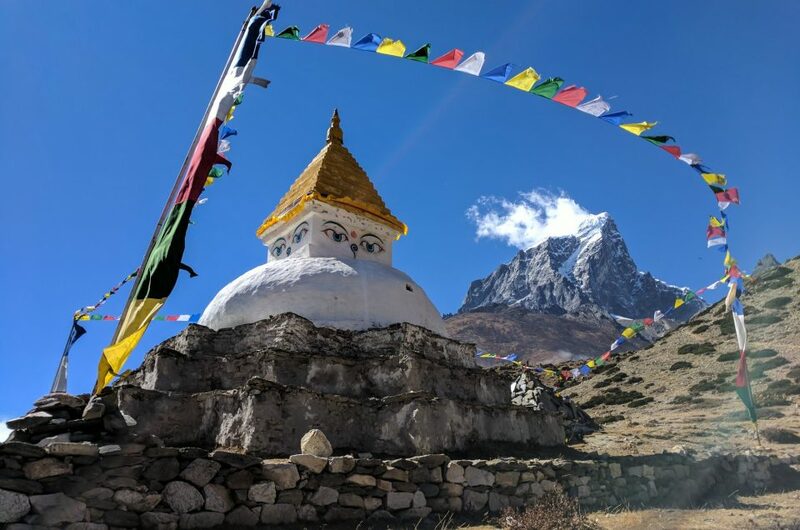 If you want to leave the mountain in a better mood, keep walking the path to the top until you reach the other temples there. You will find shops, monkeys eating bananas and stealing everything they can grab and a beautiful view. 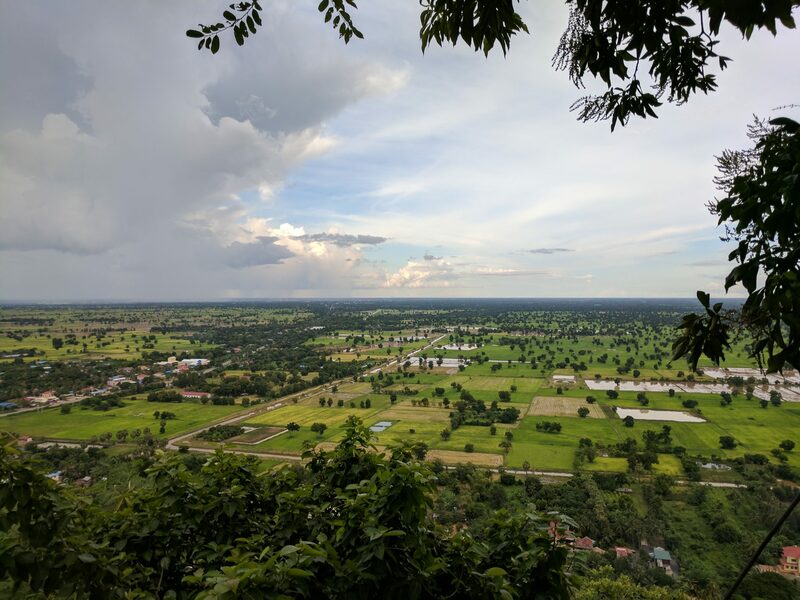 Hopefully, the view of the rice fields from the top of a new Cambodia that’s learning to overcome the past will bring back a smile to your face. By the time you finish exploring the mountain, it will probably be almost sunset. Which is perfect! Because it’s the perfect time to visit the famous bat cave! You won’t find any superhero here, but it’s one of the biggest natural spectacles of Battambang. Here, millions of bats leave the cave every evening to find food. They leave a trail over the sky that lasts for almost one hour, as they keep pouring from the cave. This is a very popular activity, so people from all over come here to watch the bats in awe. Luckily, you will find lots of places to sit down and have a drink, so just sit down and enjoy! It is the perfect way to finish your day in Battambang. You can take your camera once the show beings, and get as close as you can. But, beware! I discovered when I got close to the cave that bats actually have a very strong and hideous smell, noticeable from a surprisingly long distance. 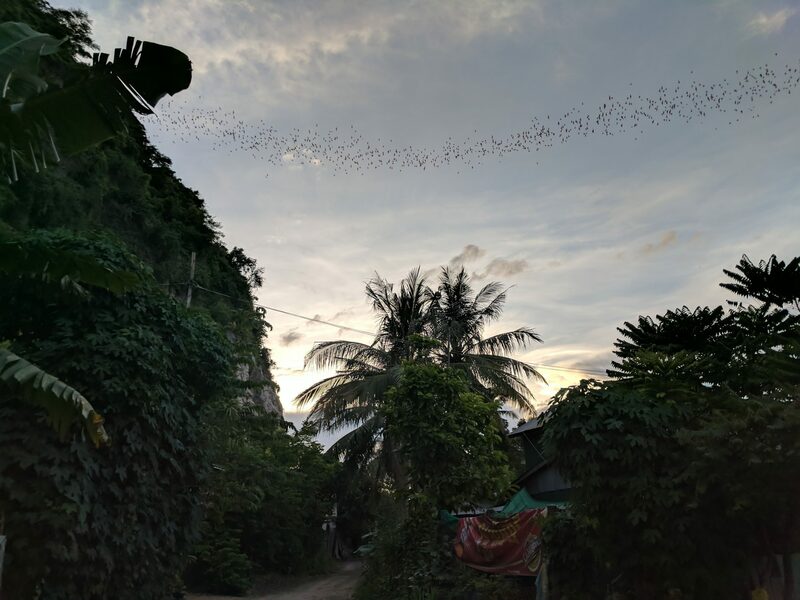 Millions of bats leave the cave every evening, thanks for getting rid of the mosquitoes! 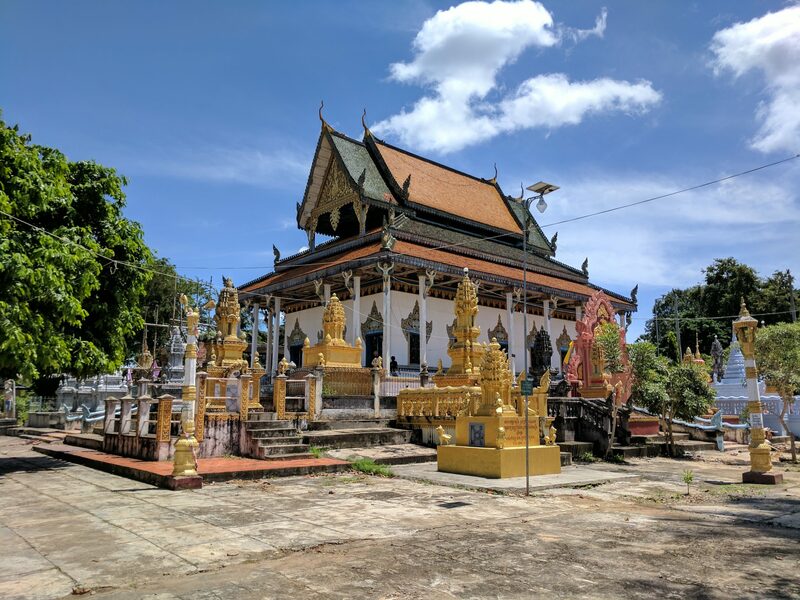 I hope you enjoyed my guide to spend a day in Battambang! It might not be as popular as Siam Reap or Phnom Peng, but this small town has a lot to offer! I definitely enjoyed my time there! Have you already been there? What would you recommend to do that I haven’t mentioned? Or let me know if you are planning to go! And as always, pint it and share it if you liked it! Oh I’ve been wanting to go on this ‘train’ for ages. Love the pictures! The train is really cool! And very bumpy too! Cambodia is in my bucket list but all I knew about Angkor and other tourisity destinations. 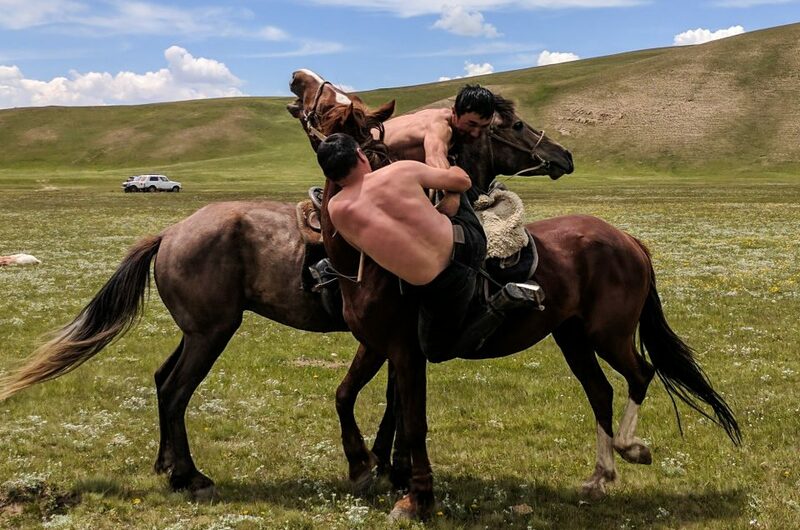 I am surely going to try upon your tips and explore this beautiful country. I’m glad I inspired you to go there! I hope you have a great time in Cambodia, I highly recommend Battambang and other off the beaten track destinations! 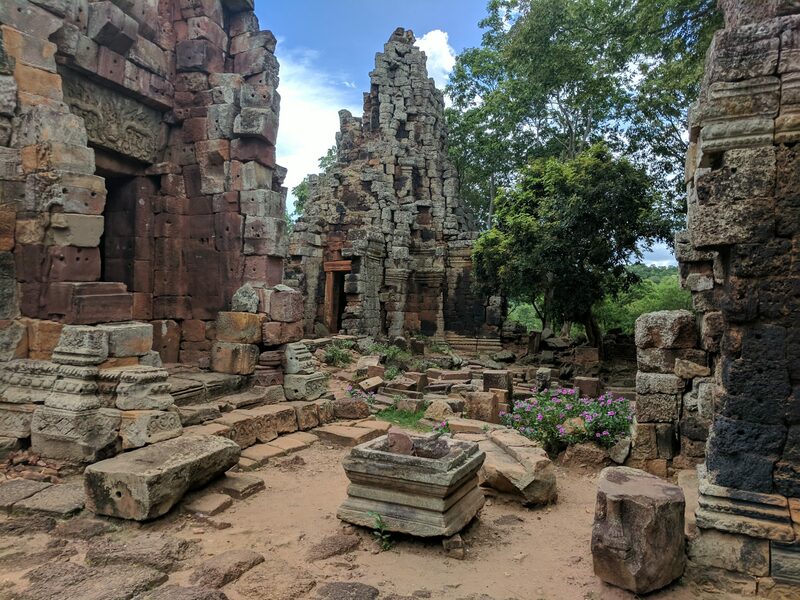 That ruin of Wat Banam – just awesome. I also liked the swinging bridge & the pagoda. How long is the bridge? The ruins were really cool! I think the bridge was about 70 meters, but I’m not 100% sure. I love the photos of the paths! The green railroad and the bridge. And oh, as an engineer I would be happy to ride on this engineering miracle – bamboo train. The bamboo train is such a cool concept! It’s so simple and it just works! As an engineer myself, I found the design fascinating. For instance, the diesel engine is always running, the speed is controlled by the driver by moving the belt increasing or decreasing the friction, or just by turning it on and off repeatedly. No need to worry about gears or complex systems. The train track and swinging bridge are so scenic! Not surprising that the entrance staircase to the temple reminds me of Sri Lankan temples. The influence is quite evident. The train track was so beautiful! And the bridge was amazing too. It’s crazy to see all the locals crossing it in motorcycles while it shakes constantly. I´ve been there and I can asure that your post is 100% complete about all the things to do there. I missed the bamboo train but I will try it on my next visit. I love your pics!! Thank you! If you go back you should definitely try the bamboo train, it was amazing! 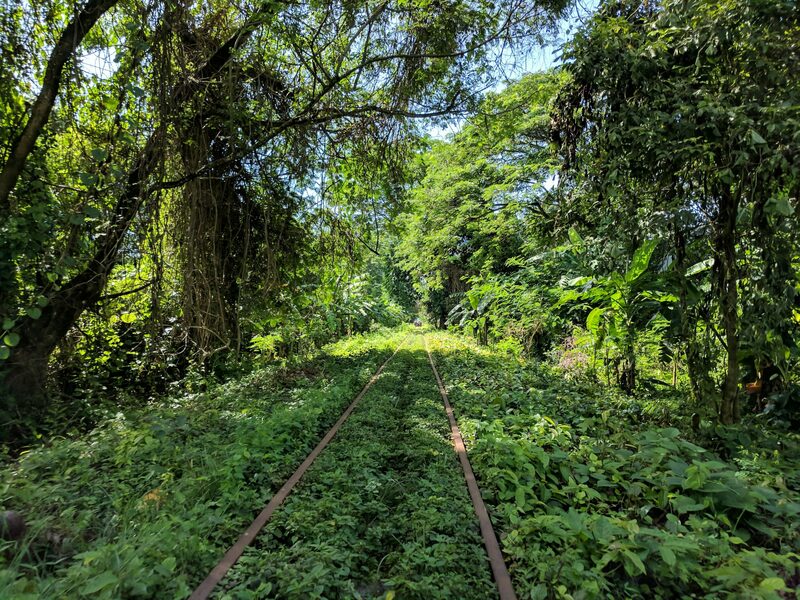 The bamboo train ride sounds impressive – simple pleasures of life! The swinging bridge and the temple are adorable. The Wat Banan temple is totally my kinda place to go. Thanks for your comment! The temple was really cool, don´t forget to go there if you visit Battambang!